When it comes to combining meditation and mind-body exercise, most of us might immediately think of yoga and perhaps all the excuses that come with it—“I don’t know the poses,” “I’m not that flexible” or “I’m too old for that.” Sound familiar? Now, there is good news for those who want to reap the mental and physical benefits of yoga but who also want something a little less daring and less taxing on the joints than downward-facing dog. It’s called tai chi. Although this Chinese martial art has been around for centuries, it has recently made its way into elderly care homes and the latest research in health. Tai chi movements are graceful, and each posture flows into the next one--most similar to Vinyasa yoga--but the idea with tai chi is that you’re always slowly moving, and you’re less likely to be stuck stretching in one pose like you often are when practicing yoga. Your muscles are relaxed instead of tense, and your joints aren’t fully extended. Unlike other mind-body exercises such as yoga and Pilates, which requires balance, abdominal strength for proper form and sometimes having to place your knees on the ground, tai chi may be less likely to result in serious injury. At the most, it may be associated with minor aches and pains, the National Institutes of Health (NIH) said. It’s also meant for all ages. “Tai chi is a very interesting form of training because it combines a low-intensity aerobic exercise with a complex, learned motor sequence,” according to Catherine Kerr, a former instructor at Harvard Medical School who has practiced tai chi for 15 years. It has even shown to relieve insomnia in breast cancer survivors, according to the latest research from University of California, Los Angeles. Researchers say tai chi works just as well as the “gold standard” treatment for insomnia, which is cognitive behavioral talk therapy. In addition to building muscle, tai chi can help the brain change, says Kerr. “Meditation, motor learning, and attentional focus have all been shown in numerous studies to be associated with training-related changes—including, in some cases, changes in actual brain structure—in specific cortical regions,” Kerr said. 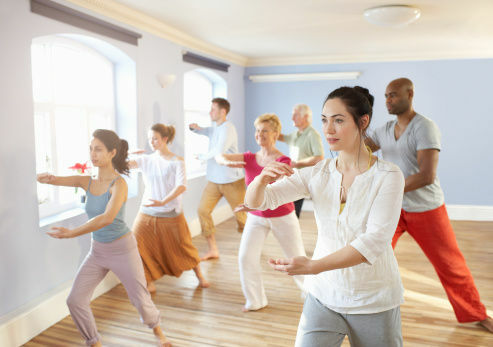 Tai chi is also being implemented in elder care facilities, because it can help older adults maintain their functional abilities and helps community-dwelling elders live independently, a NIH study found. While walking might seem like a simple physical task, it’s actually a cognitive task that can result in falling from getting distracted with another cognitive task, like talking, according to Harvard research. The meditative nature of tai chi helps with focus, memory and keeping calm. Be proactive and take a friend or older relative to a local class for a refreshing way to exercise, meditate and retrain their brain. You can read here for more information on how to prevent falls and here to learn about how to be even more proactive with arthritis.